It's all perfectly pleasant but not something I can imagine returning to regularly. Karfagen is essentially one of the many vehicles (Sunchild, Hoggwash, Akko) for Ukrainian keyboard wizard/composer Antony Kalugin. He formed the band in his very early teens and kept the name when they fell out sometime after their debut album in 1998. 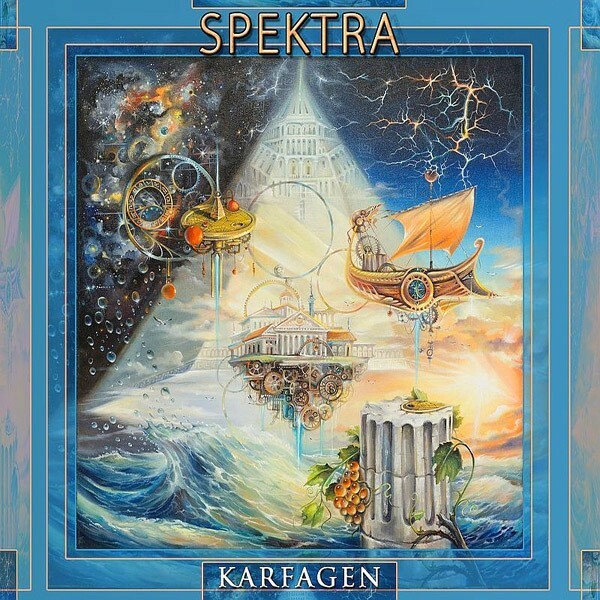 'Spektra' is the eighth album under this name and it treads a similar path to those that have gone before, rooted in late seventies and early eighties Prog Rock but with Classical influences and even New Romantic style Pop inflections. Given the style of compositions and it being an almost entirely instrumental album, there's a feeling that it has a background music quality rather than being something you'd put on and listen to intently. Consisting of sixteen tracks split into three phases, it comes across as if it might be a film soundtrack. The title track put me in mind of Rick Wakeman, but not his early masterworks, and despite there being three drummers credited, they sound programmed on the opening number. For the first of many times across the album, the wonderful guitar work of Max Velychko makes its presence known and these interventions represent the high points of the album. 'Troy' has a Steve Hackett feel to it with its acoustic guitar theme, whereas 'Transaleatorica II' is rather eclectic and features a Mellotron (?) sound that will be very familiar to fans of early Spock's Beard alongside a harpsichord not unlike that used by the aforementioned Wakeman. 'Terra Incognita' features a Gregorian style vocal and the following 'Celebration' gets quite heavy and relies on Velychko's guitar and a gritty Hammond Organ. As we reach Phase Two ('Olympia') there's the introduction of accordion into the mix, and as I'm not a fan of this particular instrument, this rather colours my judgement. 'Homonymous (Part 2)' is reminiscent of Anthony Phillips and Hackett with its acoustic guitar motif; it's short but very sweet with the understated synths bringing Genesis to mind circa 'Wind & Wuthering'. 'Dios Pyros' has more accordion while the following 'Natural Charm' is thankfully a delightful piano piece initially before it picks up the pace and is supplemented by some more fine guitar soloing. It alternates between calm and heavy sections and is my album highlight. The album closes with a live-in-studio number, 'Juggler & The Cloud' which includes more lovely piano.